The legend is more archaic, aggressive, and bloody: In 1962 Ferruccio Lamborghini, who until that point had primarily produced tractors, visited Don Eduardo Miura Fernández’s bull breeding ranch “Ganadería Miura” in the province of Seville. Whereupon he decided to make a fighting bull the heraldic animal of his company. His supercars too, with which he began fulfilling a dream and the few specimens of which had until then been identified only by numbers, were to bear the names of famous Miura bulls from then on. What for Ferrari was the “Cavallino Rampante,” was now for Lamborghini the wild fighting bull. The “Miura” was even presented on the Spanish estate. 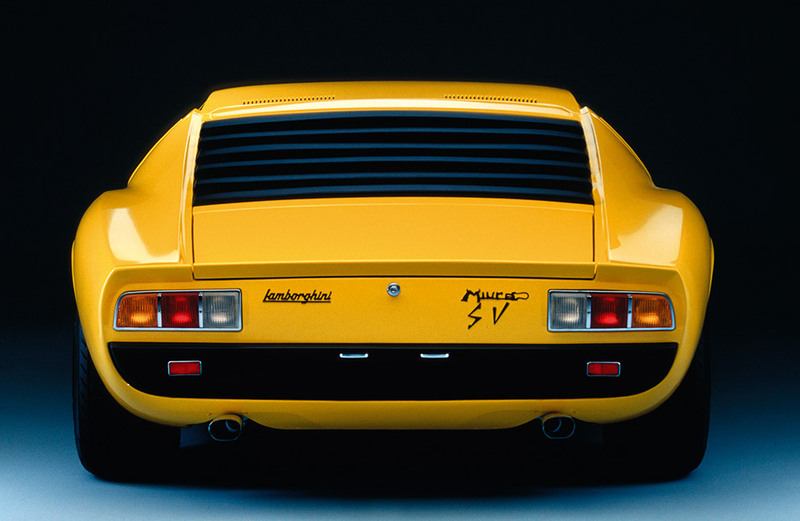 Subsequent models were named, for example, “Islero” after a bull that killed legendary matador Manolete, or “Gallardo” after one of the five historic breeds of the Miura line. “Murciélago” was named for a bull that was injured with 24 jabs of the lance in a legendary bullfight on October 5, 1879 in Córdoba and whom matador Rafael Molina Sánchez, nicknamed “Lagartijo” (“Lizard”), was unable to kill in the final battle. The bull was spared at the crowd’s request. “Reventón” however killed Mexican torero Félix Guzmán in 1943, and “Diablo” was a further legendary Miura bull in the late 19th century. In his 1932 book “Death in the Afternoon”, even Ernest Hemingway described bulls from the Miura lineage as fighters that learnt very quickly in the arena and were very difficult to fight and kill. Lamborghinis too are said to have been very difficult to control in the past. 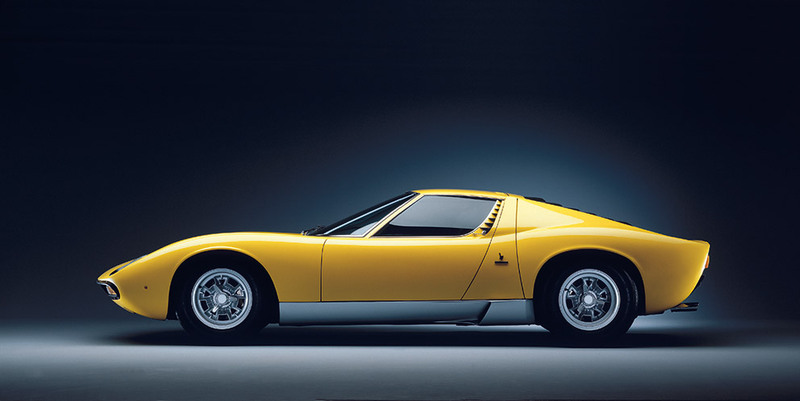 The “Miura P400” was – after the “350 GT” and “400 GT” – only the third car by Lamborghini. It was produced between 1966 and 1973 in Sant’Agata Bolognese. 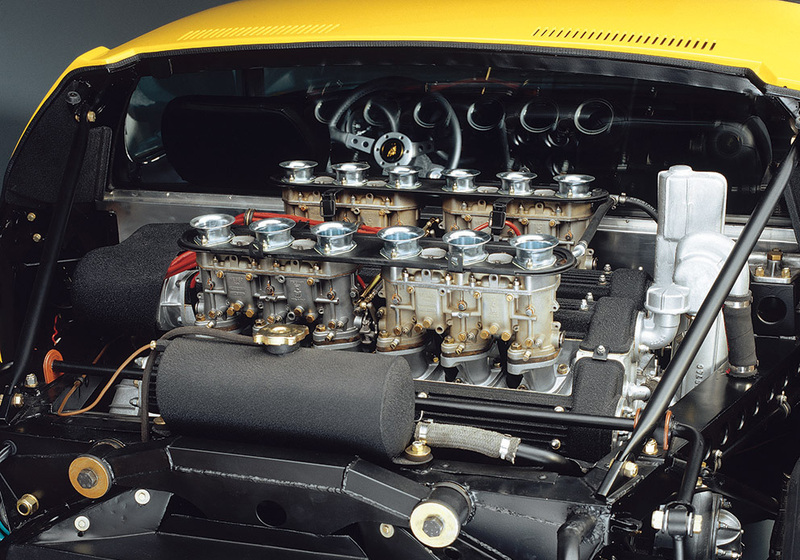 It had a transverse V12 mid-mounted engine and with its 350 HP (in later versions up to 385 HP) and a top speed of almost 300 km/h was among the fastest sports cars of its day. It was produced by hand, giving it a reputation for high-quality workmanship. It was also the first model with which Lamborghini made a profit, enabling further models to be developed and ensuring the survival of sports car production. The “Miura” was conceived by Gian Paolo Dallara. 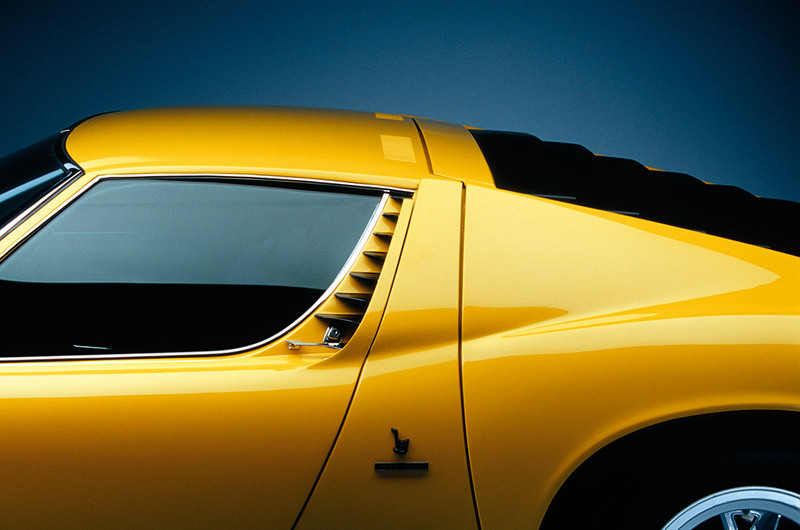 The body design, whose power and sleekness have rarely been topped to this day, was the work of then 27-year-old Marcello Gandini, an employee of Bertone. It is a far cry from the wild and untamed look of later models. The “Miura” is a mere 1.05 meters high and has a strongly slanting windscreen, which adds to its compact appearance and together with a length of 4.37 and a width of 1.76 meters ensures balanced proportions. Appropriate to its time, it also seems to have a touch of “Pop design” about it, at least when painted yellow. Its special features include the hidden headlights, which are swiveled back into the body, and the six jet-black hood slats covering the engine compartment in place of a closed panel and that make the tail look like a reptile’s back armor. Gentle curves, soft transitions, yet muscular, dynamic, crouched ready to pounce – no matter which models came after it, the “Miura” continues to be unique. 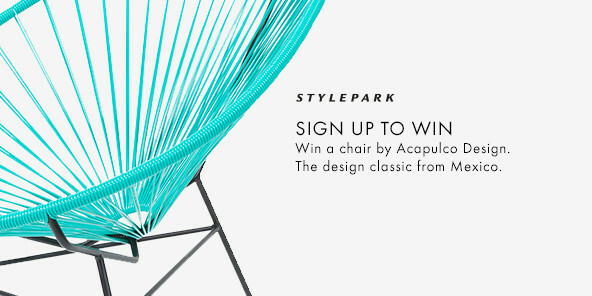 Oh to stop outside an Italian bar in a lemon-yellow “Miura,” go in, perch on a bar stool by Konstantin Grcic that carries the same name, and drink a “caffè.” Sadly it just sounds too much like a promo film.